Did you have any fears as a child? Monsters? The dark? Dogs? When I was a little girl, I had this record of the story of Peter and the Wolf, and I was afraid of wolves at night (Look at the picture and listen to him growl. Can you blame me?). I just knew they were skulking around my bed in the dark, black as midnight, drooling rabidly, ready to shred me to ribbons should I stick so much as one toe out from under the covers. It was terrifying. As adults, we look back on those childhood fears with some degree of smugness or embarrassment and think about how silly it was to be scared of something that was never a threat in the first place. But even if we don’t like to admit it, fear is something we grown ups still struggle with, at least from time to time. Finances, health, and our children’s futures may replace wolves, darkness, and the boogeyman, but fear is still fear, whether you’re four or forty. And God is well aware of that fact. In my Bible, the phrases “fear not,” “do not be afraid,” and other similar expressions appear over 75 times. Fear is a normal, God-given reaction that can be healthy and keep you safe in the event of a real threat. Fear is a blessing when it motivates you to jump out of the path of a speeding truck or stay away from a rattlesnake, but just like everything else affected by the Fall, fear can often be misdirected and thwart our growth in Christ. In other words, we worry about what might happen. Therefore I tell you, do not be anxious about your life, what you will eat or what you will drink, nor about your body, what you will put on. Is not life more than food, and the body more than clothing? 26 Look at the birds of the air: they neither sow nor reap nor gather into barns, and yet your heavenly Father feeds them. Are you not of more value than they? 27 And which of you by being anxious can add a single hour to his span of life? 28 And why are you anxious about clothing? Consider the lilies of the field, how they grow: they neither toil nor spin, 29 yet I tell you, even Solomon in all his glory was not arrayed like one of these. 30 But if God so clothes the grass of the field, which today is alive and tomorrow is thrown into the oven, will he not much more clothe you, O you of little faith? 31 Therefore do not be anxious, saying, ‘What shall we eat?’ or ‘What shall we drink?’ or ‘What shall we wear?’ 32 For the Gentiles seek after all these things, and your heavenly Father knows that you need them all. 33 But seek first the kingdom of God and his righteousness, and all these things will be added to you. 34 “Therefore do not be anxious about tomorrow, for tomorrow will be anxious for itself. Sufficient for the day is its own trouble. Clearly, it is not God’s will for us to worry. No matter how strangling our fear may feel, God wants us to trust Him in everything, from the most dire situation to the most mundane. But how? 1. Make sure the object of your trust is the right one. A popular false teaching from the Word of Faith (prosperity gospel) camp these days is that it’s never God’s will for you to be sick, poor, or experience tragedy. If you just have enough faith, and decree and declare enough, you can yank whatever outcome you want right out of the hands of God. Do you know why that’s not true? Arguably the mightiest men of faith in history, eleven of the twelve disciples were martyred. So was Paul. David, whom God said was “a man after His own heart” suffered tragedy after tragedy. Jesus Himself prayed in Gethsemane that God would keep Him from having to go to the cross, and God said no. Like these godly men, as Christians, we do not place our faith in positive outcomes. We place our faith in Christ, and His sufficiency for us in all things, regardless of the outcome. Make sure you’re trusting Christ, not what you want Him to give you. 2. Get off the guilt train. Sometimes we can fall into Satan’s trap of believing that if we’re really saved or really trusting the Lord or really have faith, we’ll never fear anything. Then, when those worries creep in, we start feeling guilty. We’re not supposed to have those feelings. Have you ever read the story of Gideon? Gideon was one scared dude, and he had good reason to be. But even though he was scared and fumbling, he believed and obeyed the Lord. And the Lord commended him for being a man of great faith. Trusting Christ doesn’t mean you’ll never be afraid of anything. Trusting Christ means you keep believing Him, keep loyal to Him, and keep obeying Him even when you are afraid. Trusting God doesn’t mean you should be careless. Eat healthy and exercise. Be frugal. Watch your children carefully. God gave us a whole book about using wisdom, and He gave us brains, so let’s use them. 4. You’re not in this by yourself. God has promised never to leave you or forsake you. He has promised to give you the strength to deal with anything you come up against. He has promised you a way out of temptation. Trust that God is with you and will help you. 5. Rehearse your trust instead of your fear. A lot of therapists will encourage you not to “repress” your fears but, rather, talk about them, write about them, examine them, etc. In other words, rehearse them (which only leads to more fear, because fear feeds off itself). But the Bible never says to do that. It says, “do not fear” and “trust in the Lord.” Period. No analysis required. Those worries may start creeping in, but you don’t have to set the table and turn down the bed for them. Push them right out of your mind, slam the door behind them, and say (out loud is helpful), “No. I’m not going to worry. I’m going to trust the Lord.” You’ll still feel worried at first, but “fake it ’til you make it.” Your feelings will eventually follow. 6. Replace fearful thoughts with biblical thoughts. 7. Get your mind off it. Watch a good movie. Have coffee with a friend. Better yet, serve someone who needs your help. Share the gospel with someone who’s lost. Get your mind off the worries and on to something better. Go running or do some physical labor around the house or something like that. Either you’ll get some endorphins going and you’ll start feeling better or the shin splints and backache will completely erase any memory of whatever you were afraid of. 9. Repent and get a fresh start. Sometimes (often, if you’re like me), you’re going to blow it. You’re going to give in to fear and let it control you instead of trusting God. You’re going to act on your fears and disobey God instead of trusting and obeying Him in spite of your fears. When that happens, don’t run away from the Lord. Run to Him. Repent and be forgiven. That’s what His mercy and grace are all about. Worries are a normal part of life in a fallen world, but, in Christ, we are not to be enslaved by them. We have a Savior who is sovereign over all things. He clothes the grass with lilies. He feeds the wild birds. And He cares oh so much more for you. Trust in the Lord with all your heart, and fear not. 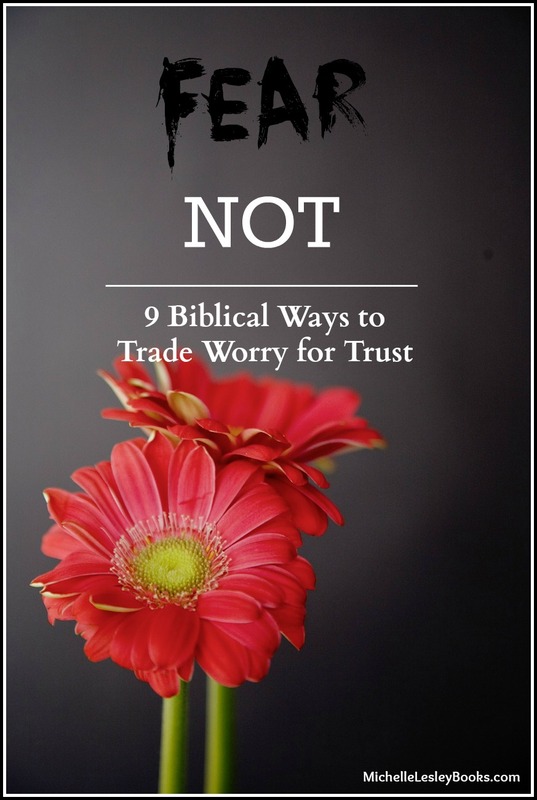 How do you deal with worry in a godly way? I love this because your advice hits on sound Biblical thinking, and at the same time, plain old practical “do the next thing” wisdom. I’m reading Praying Over the Promises right now by Thomas Yeakley. He encourages his readers to take God at His Word, trusting an pleading the promises in Scripture. Your words reminded me of the truth I’m getting there. I particularly appreciate #2. Thank you for writing this post!